It’s no secret that Windows 10 likes to forcibly apply updates, and occasionally these forced updates can occur at very inopportune times. 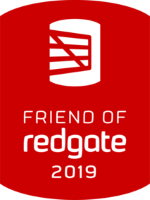 I’ve heard tales of forced updates ruining demonstrations and presentations not only at SQL Saturdays, but also at this year’s PASS Summit. All the settings shown here first appeared in the Windows 10 Creators Update, version 1703. By this point you probably have it on your machine (in fact, as I write this, the Fall 2017 Creators Update, version 1709, is now being pushed out to users.) But if you’re unsure of your windows version and want to check, right-click on the start button and choose “system” to bring up information about your PC. 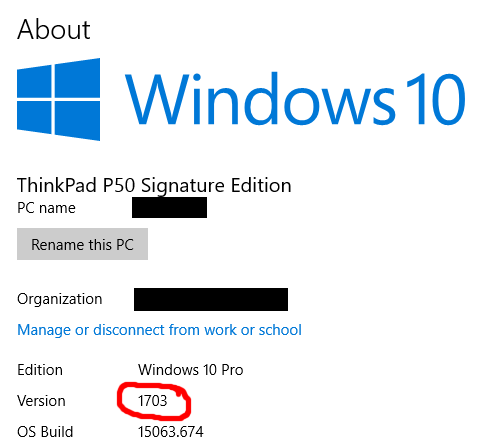 So long as you have version 1703 or later, you’re good! 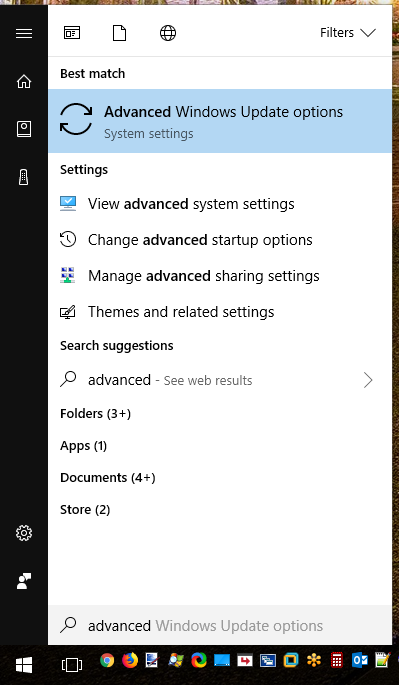 Navigate to this menu by clicking on the Start button and searching for “Advanced Windows Update Options”. Towards the bottom is the silver tuna: the “Pause Updates” switch. As the very helpful description states, pausing updates stops their installation for up to 35 days (unless you un-pause it sooner). Once those 35 days are up, you must bring your device up-to-date before you are allowed to pause again. Moving up from the Pause Updates switch are two drop downs that allow deferment of updates. “Feature updates”, which are released semi-annually, can be delayed for up to a year. “Quality updates”, the cumulative monthly updates, can be deferred by up to a month. Moving up again, you will find the Windows servicing channel. The channels available to you depend on which edition of Windows 10 you are running, and a matrix is available here. Adding to the confusion is the fact that Microsoft is changing the names of the channels in the Windows 10 Fall 2017 Creators Update (version 1709). The Current Branch is considered appropriate for home users, and receives updates as soon as they are available. Beginning in version 1709 this will be renamed to “Semi-Annual Channel (Targeted)”. The Current Branch for Business receives updates a few months after they are made available, and is directed towards business users. Beginning in version 1709 this will be known as the “Semi-Annual Channel”. Thank you, Microsoft, for taking some pretty straight-forward names and changing them to be nearly identical and way more confusing. Here’s what I do: if I have a presentation or other important event coming up, I pause updates a week or two beforehand. This gives me adequate time to test everything in a stable environment as well as the peace of mind that unexpected updates won’t occur. I also allow my feature and quality updates to be deferred by up to 15 days. That way, if an update does pop up out of nowhere, I’m not forced to install it immediately. Good information. Another approach is for presenters to try to do a better job of keeping their presentation machines up to date in general, whether it is the OS, or SQL Server. That way, there is less likelihood that any pending updates will be automatically applied at a bad time. Turning on Pause Updates the day of a presentation is a good safety measure though.